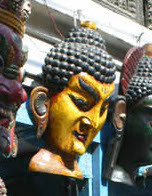 "In the old days, the tourist hub of Kathmandu was Jochne, aka 'Freak Street'. But the hippies are long gone and Thamel is now the place for travellers to relax in lively bars and international restaurants." Kay and Dave pay a visit to Nepal's capital city.